What the heck is an FB? Month of letters is just a pleasant memory now and I’ve been “Marching On” with my letter writing. This year I included writing letters to my family whom I usually email and also met a few new friends on the Lettermo website who added interesting new conversations to my correspondence. 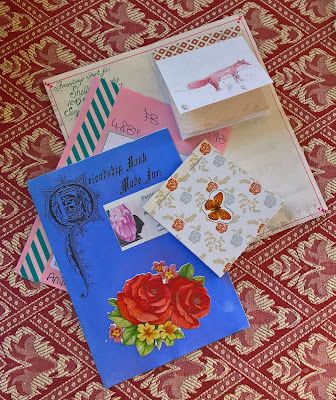 Some of my family have written letters back which was a lovely surprise so I have enjoyed the whole experience this year, it was fun and I caught up with my letters as well as making some nice new friends in the process. When you compose a letter to someone you haven’t written to before, you begin a fresh conversation, though you tend to revisit subjects you have explored with existing pen pals. One of the topics that came up several times in my letters to new correspondents was friendship books. Before the internet made finding pen pals easy, friendship books were all the rage and everyone passed one or two of them with their letters. Of course, not everyone is familiar with the concept of exchanging friendship books and I’ve been asked quite a few times these past few weeks “What the heck is an FB?” so I thought perhaps a refresher was in order to highlight just how fun and fabulous these little booklets are. Back when I was a newb to letter writing, I too asked that age-old question: “What the heck is an FB?” The most interesting reply I received was that they began in the 60s when Beatlemania was at its peak. Back then they were referred to as “Fan Books” and were used as a means for other fans of the Fab 4 to connect with one another. Eventually, the name changed to friendship books when others, who were not fans and merely looking for pen pals began making them and passing them along in their letters. So, what does an FB look like and what does it do? It’s a little booklet or folded sheet which is made for someone specifically who is looking for pen pals. Some are plain, others, called Decos are very arty but all have the same basic premise; to be filled with prospective pen pals. In making an FB, the name, address and a few interests or other facts are added about the person you have chosen to make the FB for; a mini pen pal ad if you like. The person who makes the FB then adds their name and details and sends it off into the wild to be signed and passed along until it is full, the last person who signs sends it back to the person it was made for. When you receive FBs you should write your details and pass it on to one of your pals but you can also write to the people who have signed before you so everyone has the opportunity to find new pen pals along the way. FBs are meant to be signed and sent without delay, though some hold on to them far to long making them out of date which is a bit of a shame. It’s a good idea to put a date on any FBs you make or sign to let others know how current they are. Because they go through the post, it does take time to be filled with names and addresses so sending them off shortly after you receive them is of the utmost importance. I’ve noticed lately email addresses are being added so that confirmation of the mailing address can be made before posting a “homer,” which is what full FBs are called. There used to be groups dedicated to making sure these little books made their way back home. You could join a group to make sure your current address was always on file. These groups not only compiled databases of current names and addresses, they also gave people a chance to ask about those who weren’t on the list and there was constant input so that all FBs had a sporting chance to reach their final destination. I’m not sure these groups are still out there, at least the group I was part of hasn’t been active for a long while. In any case, sending promptly is key. Making FBs for yourself or others is fun and though there aren’t really any set rules, it’s probably a good idea not make them too large or too bulky for ease of passage. No one wants to pay extra postage just to include an FB. Likewise, too many pages means it will be circulating for a very long time and by the time you get it back you may not want new pen pals any more! Writing legibly is essential too, if you want people to be able to write to you, they need to be able to understand your handwriting. The brevity of these little booklets and sheets means that just as you do when you text or tweet, you become economic with words and abbreviate often. Some abbreviations, like T/Y, for thank you, are obvious, but others can make you scratch your head trying to figure them out so here is a small list of FB shorthand to give you a head start. Now that you are armed with the basics, get out there and have a some fun making and sending FBs. Labels: Friendship Books, Lettermo, March On. What a wonderful idea. I've never heard of an FB. Sounds like potential fun. They are fun Sonja. There are different types of FBs too like the Decos I mentioned in my post but also Fribs where each person to sign adds to the story that has been started, Lyric or Quote FBs in which you sign and add your favourite song lyrics or a quote you like and there are slams which ask a variety of questions or ask you to add stickers in given themes. I'll send you an FB when I next write so you can see what they are like.